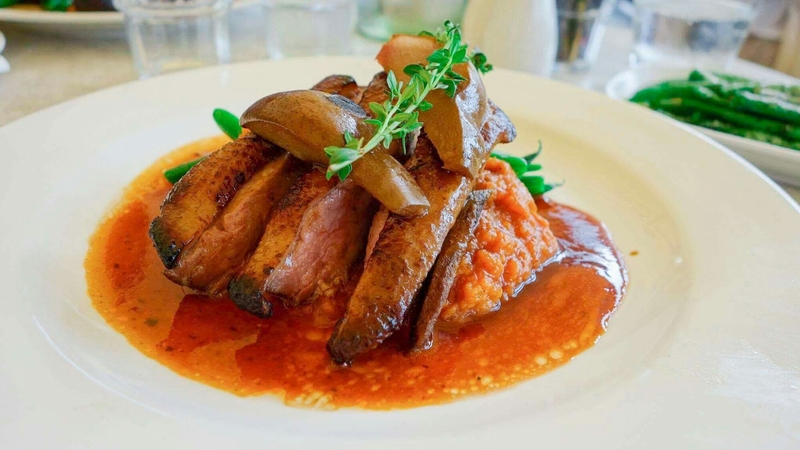 The beautiful setting making this restaurant suitable for any occasion, be it a nice breakfast, family lunch, a catch up with friends or for an event. The restaurant is child friendly with kids menu’s and food for them to feed the resident fish and ducks.If you drive, there are two locations to park, both with a short but scenic walk involved. If you aren’t so mobile take a ride on the travelator. Take a boat if you have one or if you want to work up an apetite you can also kayak or SUP(stand up paddle) in, just take note of tidal movements. 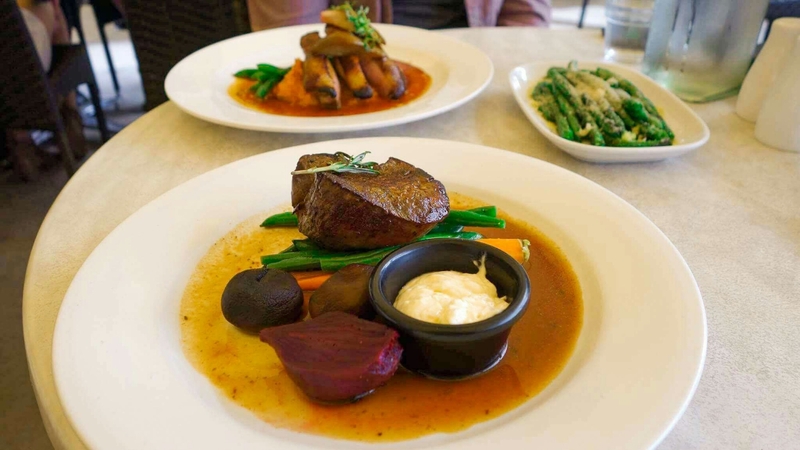 On this occasion we visited echo on the marina for a fabulous Sunday lunch. The service is attentive, yet relaxed. 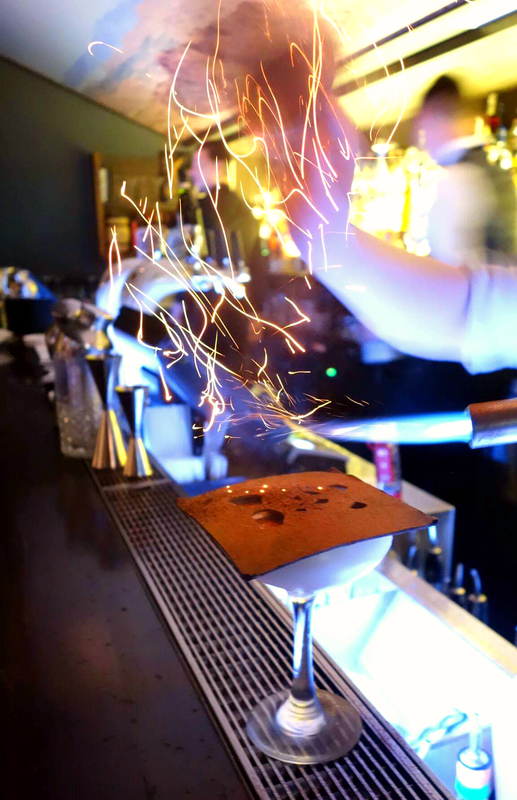 The staff enjoyed their work and had a good dynamic which adds to the great dining experience. They cater to allergies and dietry requirement, just let them know in advance. To start we enjoyed the fresh flavours of the seared tuna tataki with a celeriac and caviar salad with a fluttering of beetroot leaf. An ideal way to start the meal. We followed this with something substantial. 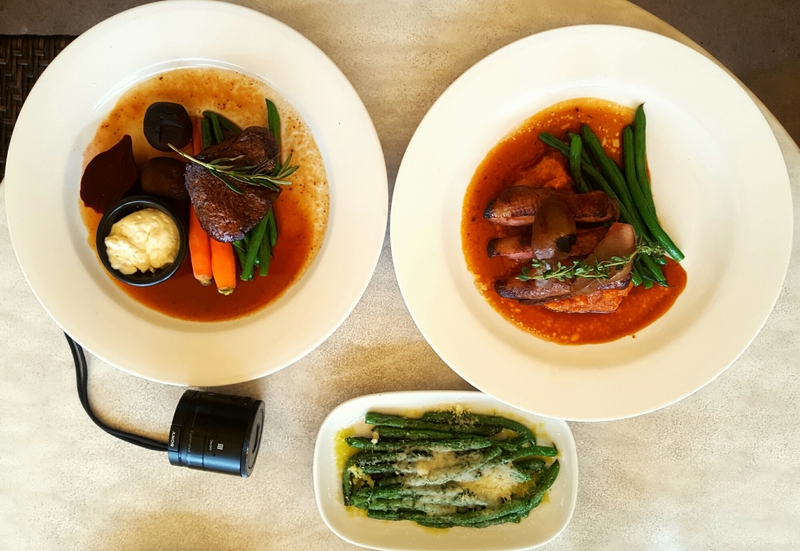 We odered an amazing rib eye and smoked duck with a side of parmesan crusted, pesto green beans. 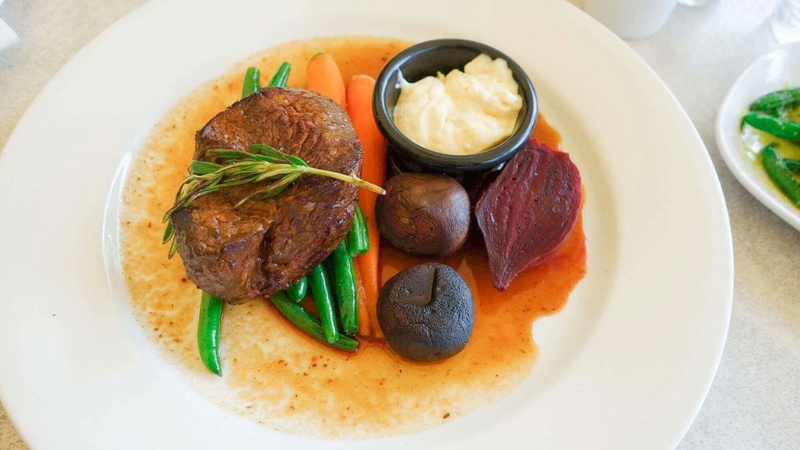 The rib eye cooked to perfection, served with roasted baby beets, heirloom carrots, green beans and mushrooms sauced with a jus and a side of horseradish cream. 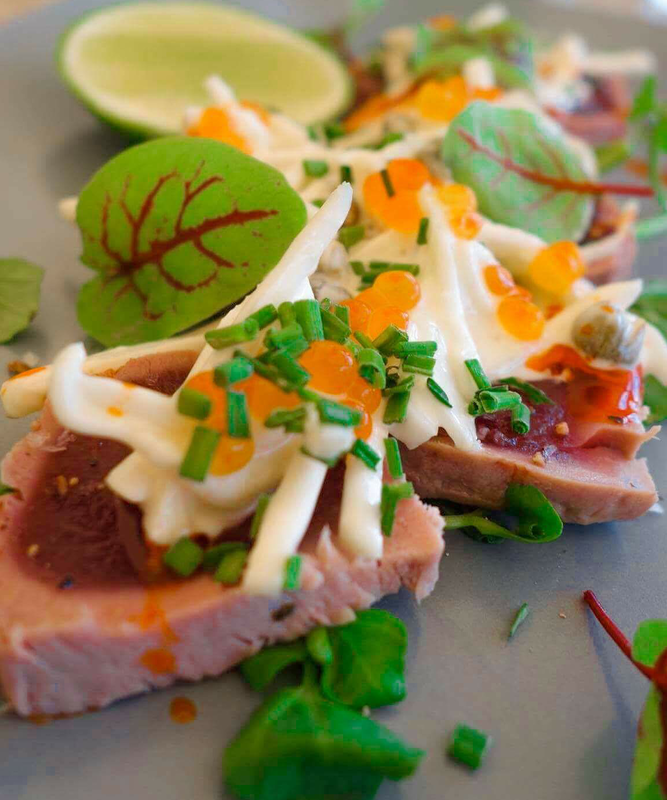 The smoked duck was succulent and has me salivating just thinking about the dish. Accompanied by sweet potato mash caramelised pear and green beans. Although the desserts sounded inviting we passed on this occasion due to the generous portions size of the meals we ordered. Enjoyed a meal by the water in a tranquil setting surrounded by the boats moored on the marina. We will definitely return. 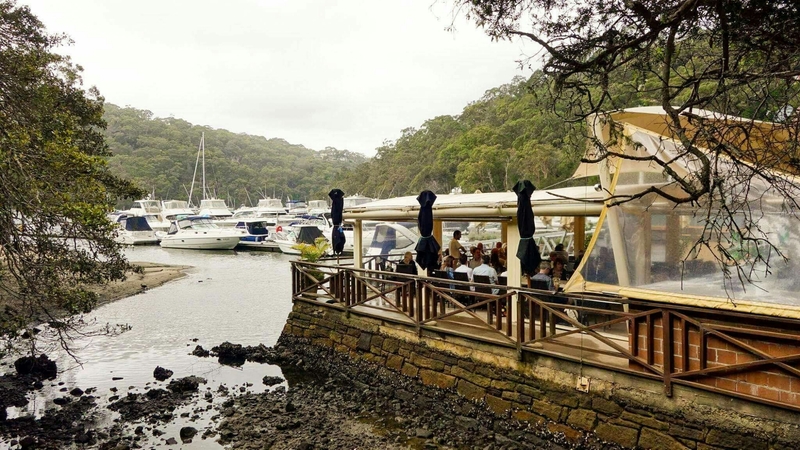 The Crows Nest dining precinct is on the up and ​Chachi’s restaurant and bar is the latest addition. A creation of Dan Sofo from the Firefly group the name is influenced by Chachi from Happy days Fonzies fun younger cousin. The restaurant has cool vibe, dimmed lighting with neon signs, a huge bar the whole place speaks fun! Upstairs is a function space perfect for groups and private funcions. A great place for a beverage or two and a bite to eat. 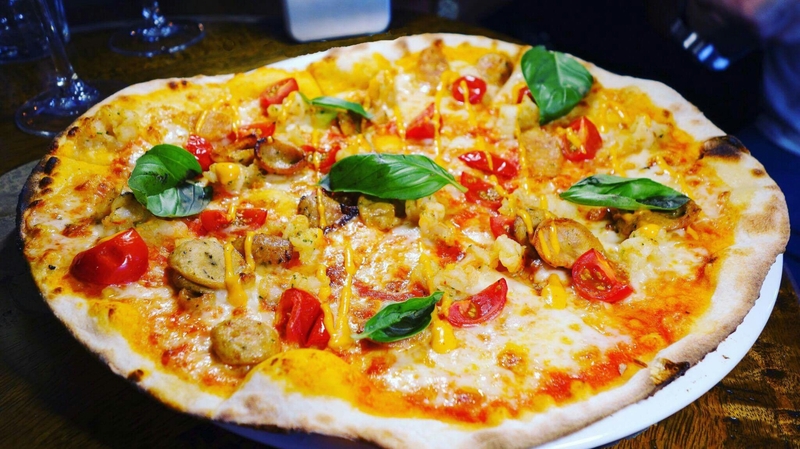 Serving up great Italian food with a range of entrees, salads, pizzas and pastas. 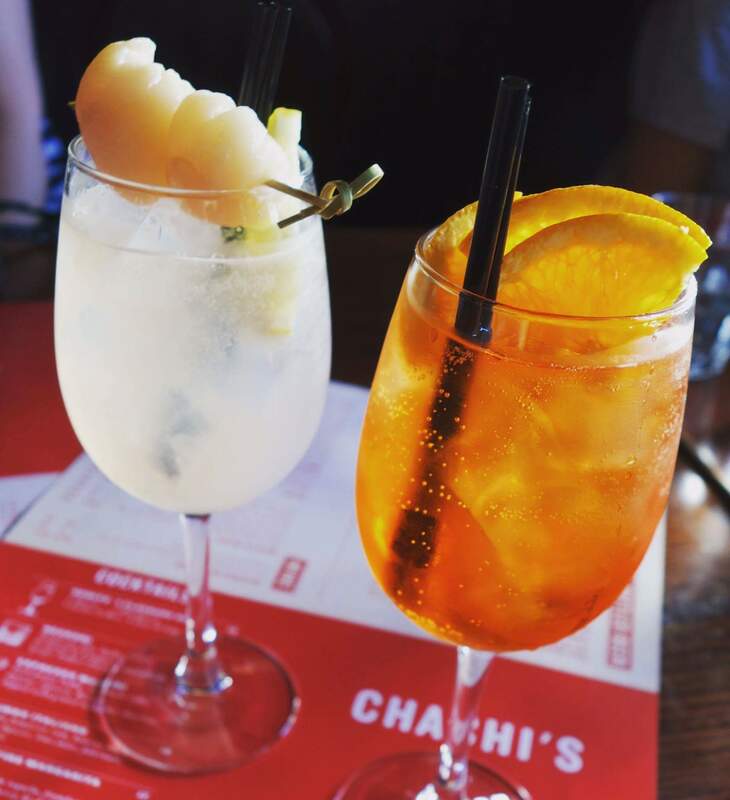 The cocktails are the goods: their specialty being the Aperol spritz, with a few versions to choose from. 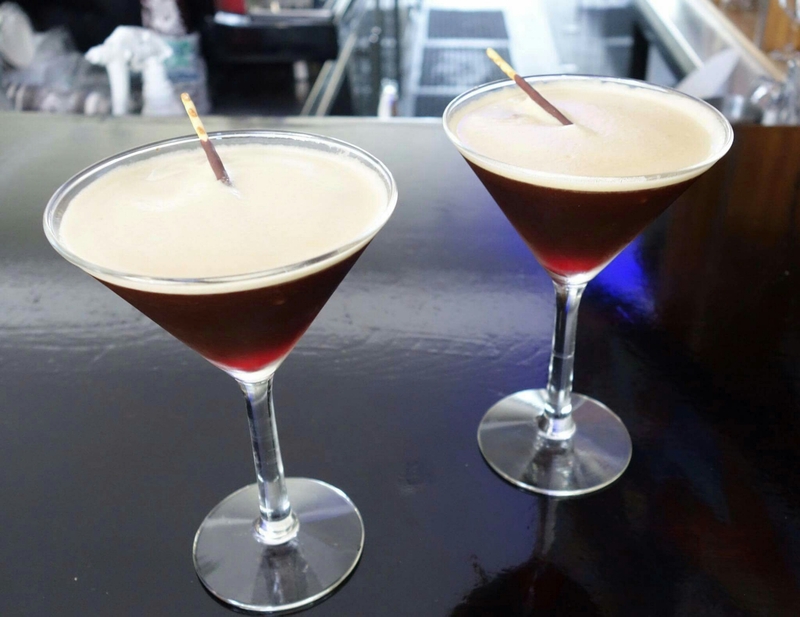 Made by their mixoligist of Italian heritage, who better to make a good one. Perfect for hot summer days and steamy evenings. 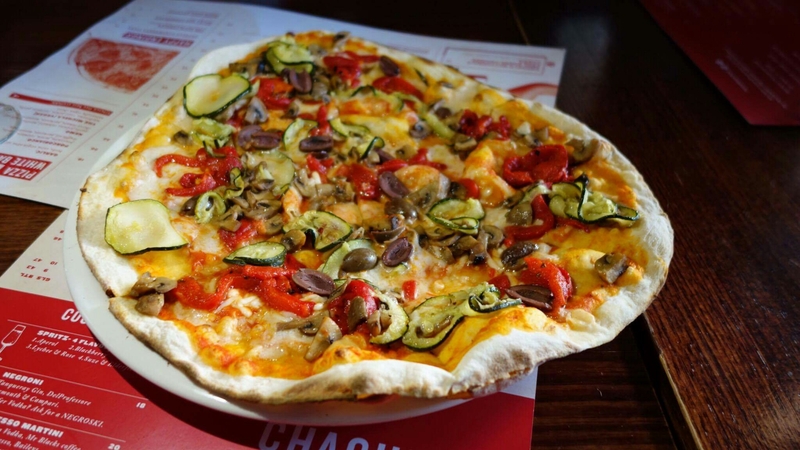 In Italian dining style we shared a number of dishes including their pizzas which have a nice thin bases and a good combination of ingredients that work; the JLO-chicken and chorizo, onion and mozzarella which was delicious – ‘The Chachi’, a vegan pizza with mushroom, zucchini, capsicum, olivia and “notzarella”. Not being a vegan myself, I had my doubts but it tasted just like a regular pizza! Well done. 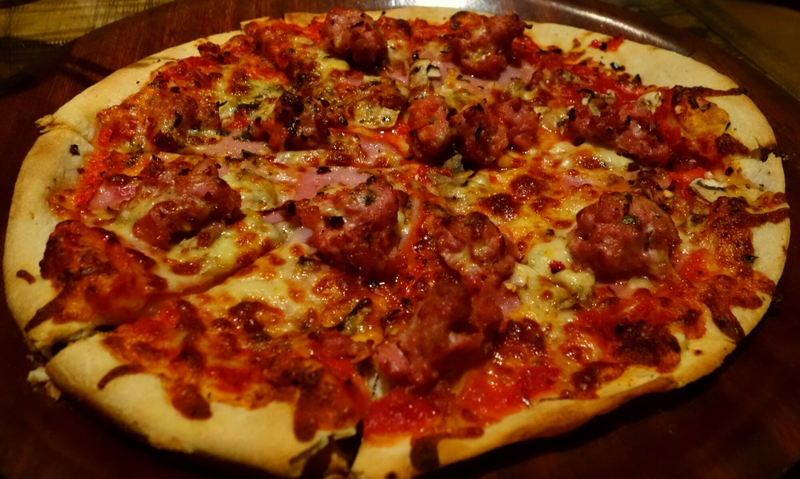 We also tried the TNT, a pepperoni pizza with olive, capsicum and mozzarella. 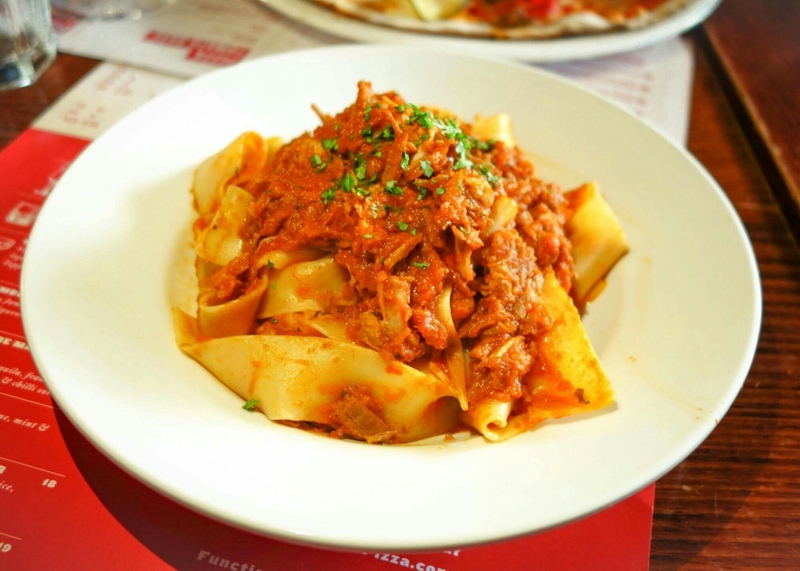 On to the house made pastas, my absolute favourite here was the pork and veal ragu – melt in your mouth meat with a beautiful tomato sauce on a fettucini. 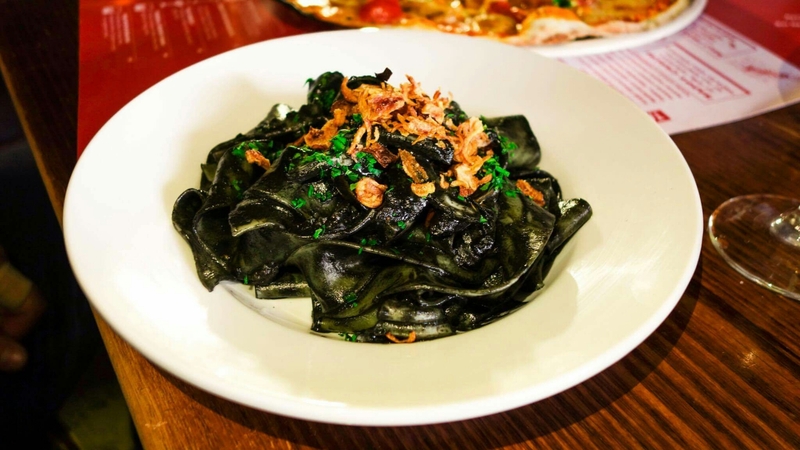 Then, a squid ink, calamari and cherry tomato pasta – what a stand out. We also tried the fennel and rocket salad and the beetroot and sweet potato salad. For those of you wanting smaller snacks, that option is there too; arancini, truffle fries, zucchini fries, calamari, meatballs or mac and cheese. We ended on a peanut butter parfait with chocolate sauce – incredible. This place also caters extremely well for gluten free and vegan diets. Mon – Thursday they do a pizza or pasta and drink for $20 which is a good deal. Great Italian joint with good food and cocktails. 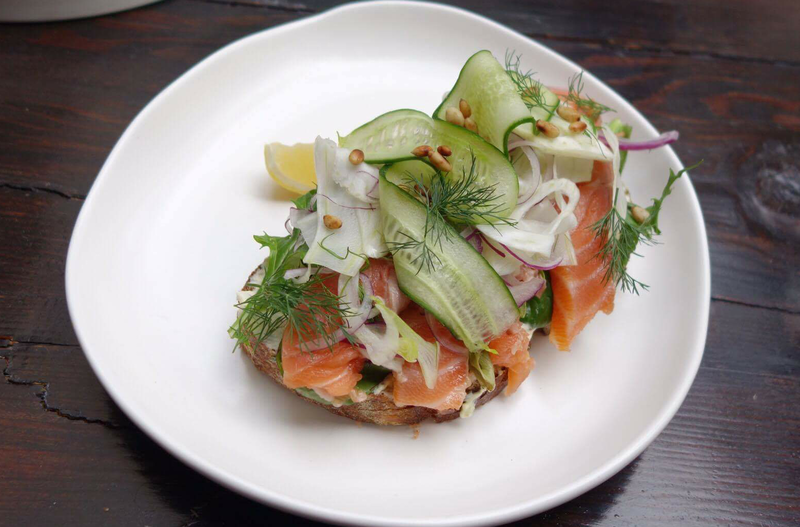 The location of Sticky Fingers has a bit to do with the name, being located around the corner from Police headquaters in Surry Hills. The cafe has a contemporary industrial feel which seems to be rage these days. The cafe has an open kitchen and open floor plan and outdoor seating. Sticky fingers is a licensed venue is currently opened for breakfast as well as lunch and there is talk the restaurant will soon open for dinner. The staff are relaxed and personable. 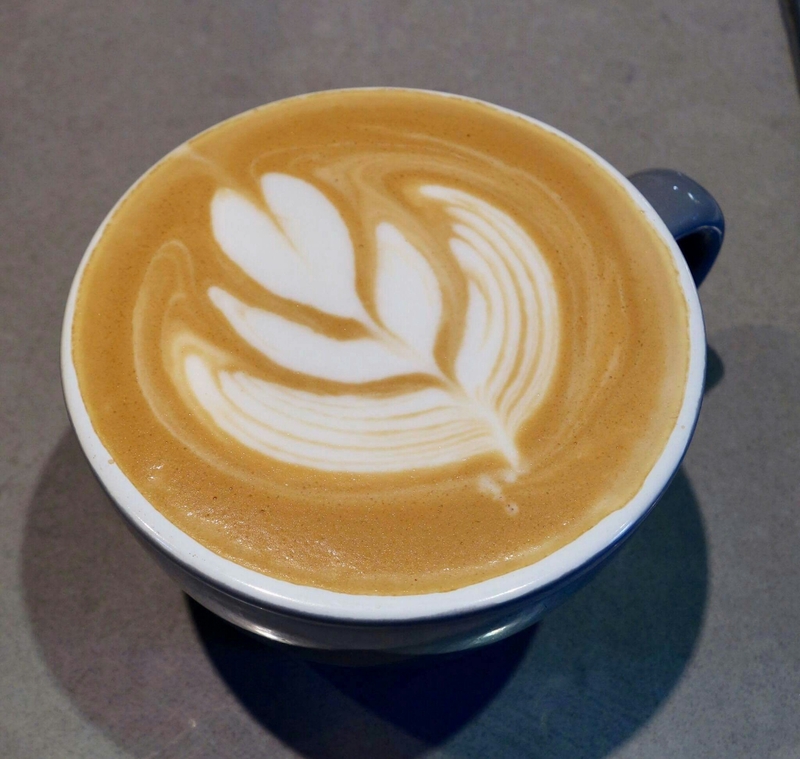 Billy the barista makes a great coffee using golden cobra and is profficient with latte art which is an added bonus. We ordered mainly from the breakfast menu was exciting, with bit of south east asian inspiration. 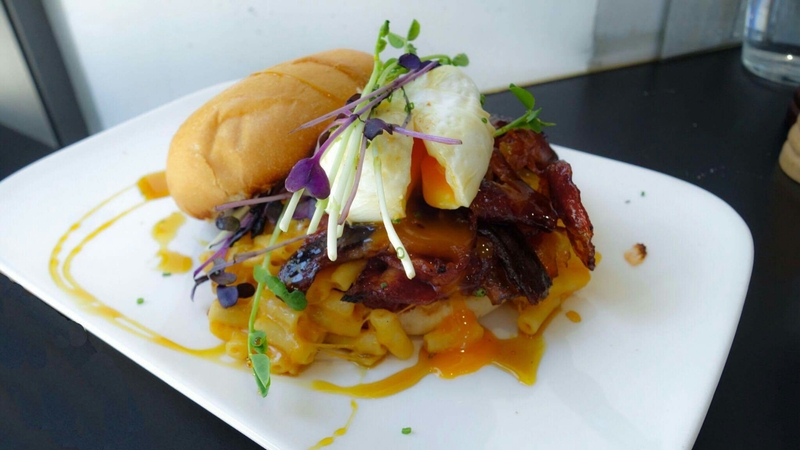 The sriracha mac and cheese burger with maple bacon and a poached egg was a hit. A great burger with a chilli kick and maple glazed bacon. A great combination of ingredients. 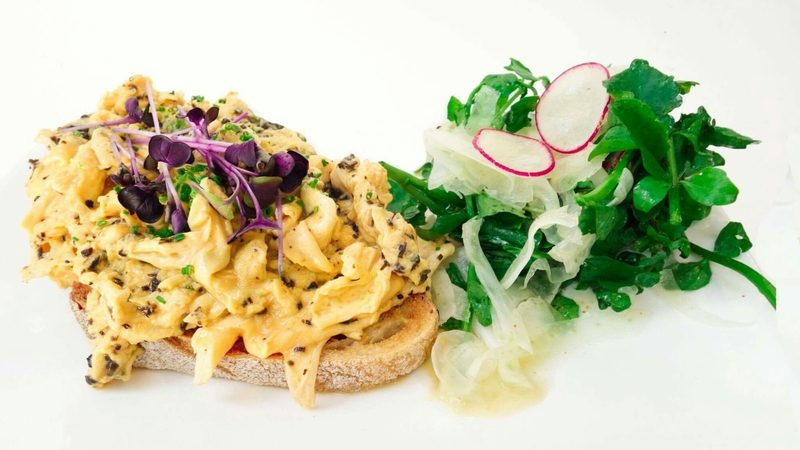 The truffled eggs with beetroot kimchi on sour dough another great breakfast option. Combing many ingredients that we like beetroot, kimchi, eggs and truffle. Pete’s pancakes with were put on the menu for a regular Pete who would continually asked for pancakes. A beautifully decorative meal with a small stack topped with fresh fruit, black sesame ice cream and miso caramel. 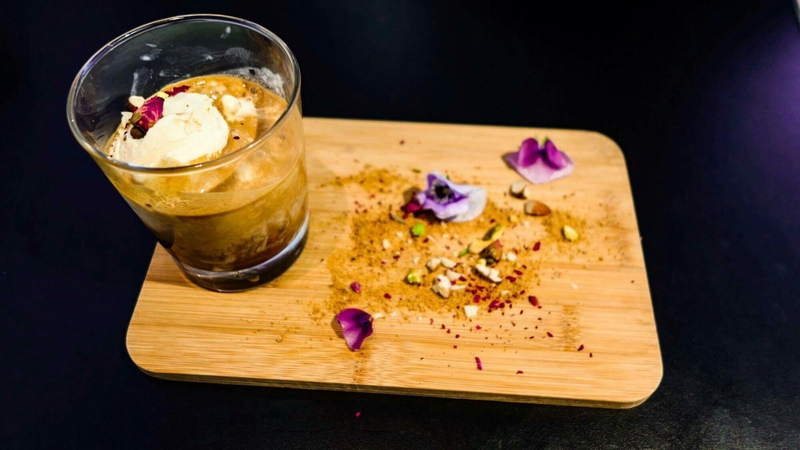 Speaking of miso caramel: the miso caramel affogato was a revelation. Do order if you visit. The pandan panacotta was a favourite, a great looking dish with beautiful textures and flavours. 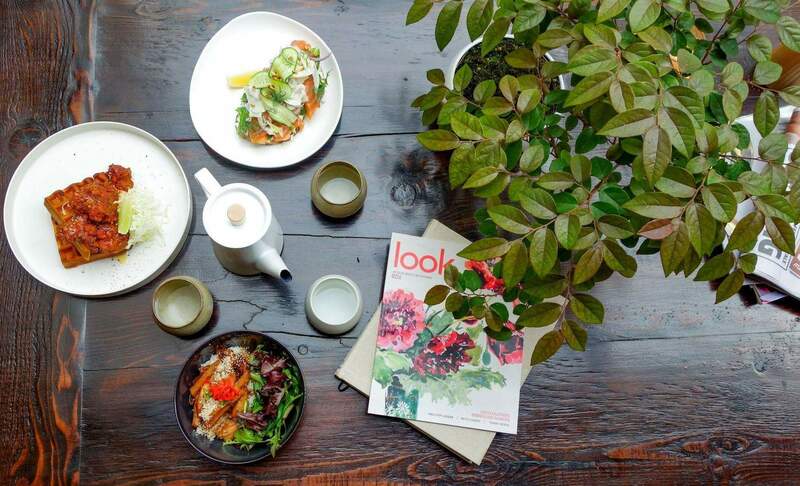 A trendy cafe with great coffee and an innovative menu. 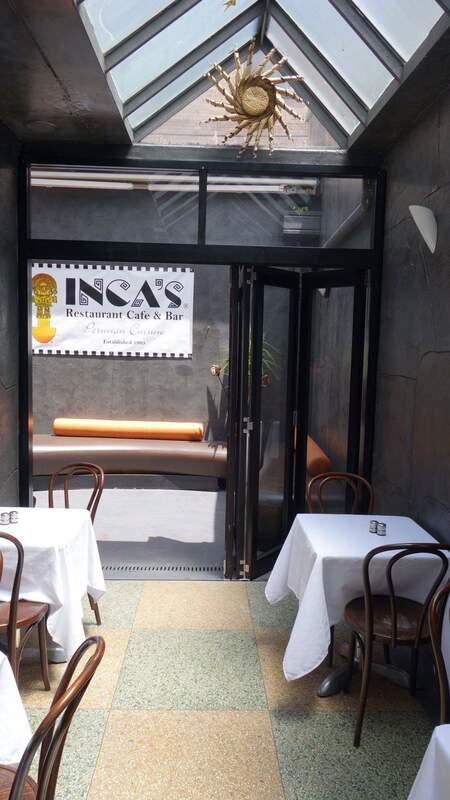 Inca’s the latest addition to the Stanley Street dining precinct. Having opening 22 years ago initiated by cravings of food from their native Peru. This place was first peruvian restaurant in Australia. Many meals later, Blanca, her two sons, Pablo & Marco and daughter, Laura continue the tradition relocating from Newtown to Darlinghurst. 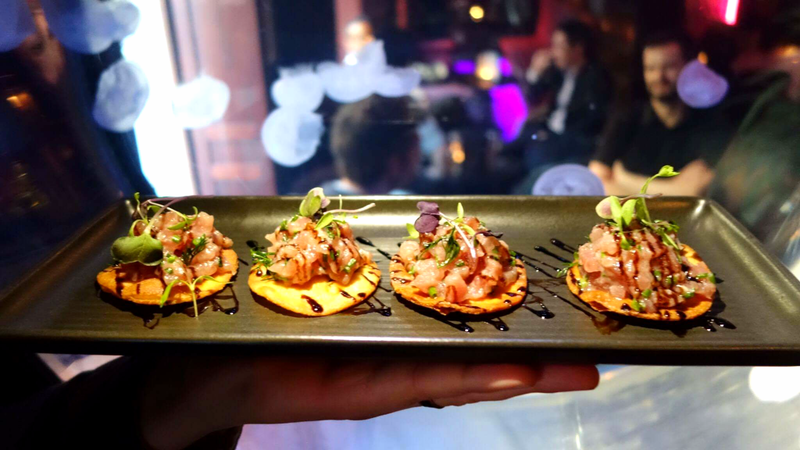 They bring old favourites from their popular menu such as the ceviche and meat dishes with big plans to evolve and continue to share the food story of Peru with new items. 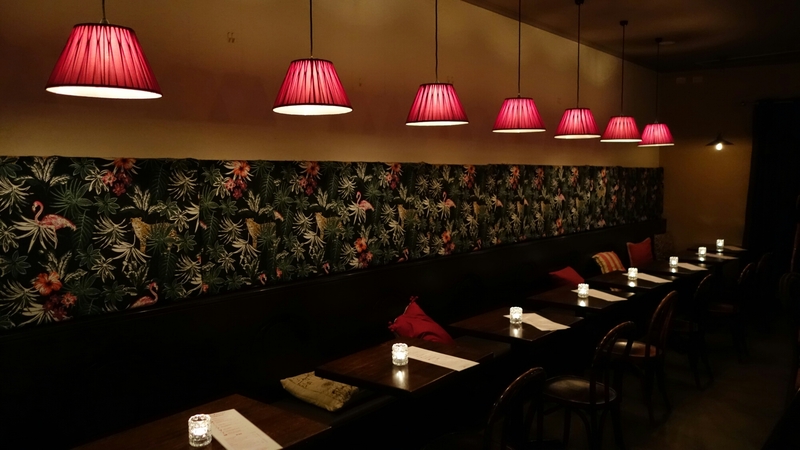 The restaurant is a large space with three areas suitable for private dining, a fancier section with table cloths and wine glasses or a casual setting at the front if the restaurant. 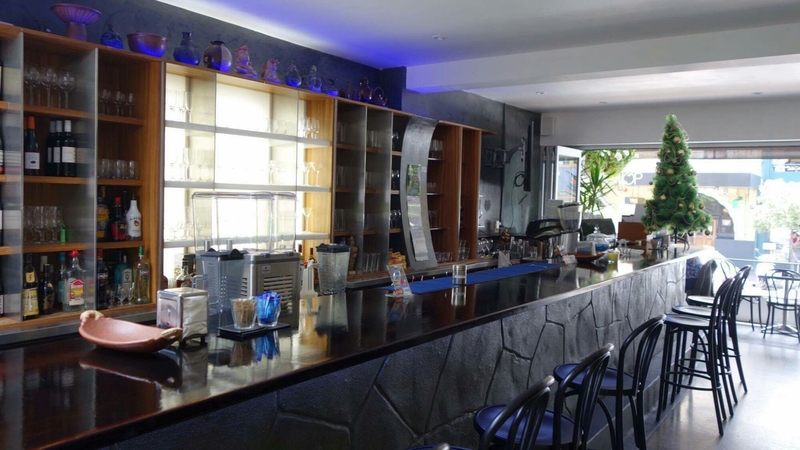 There is seating at the bar and a courtyard – ideal for casual after work drinks! absorbed into the fresh seafood and the crunch from the dried corn. 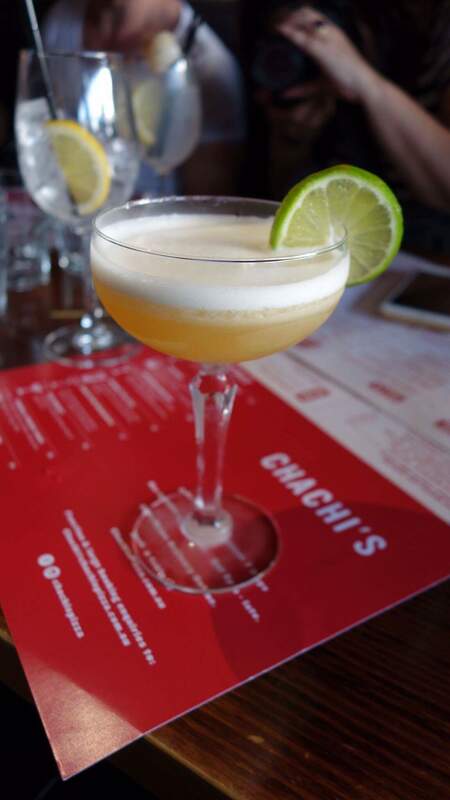 They also make some great cocktails – we started with a delicious Pisco Sour and a Passionfruit sour. Using real fruit pulp, this was a great start to our meal. 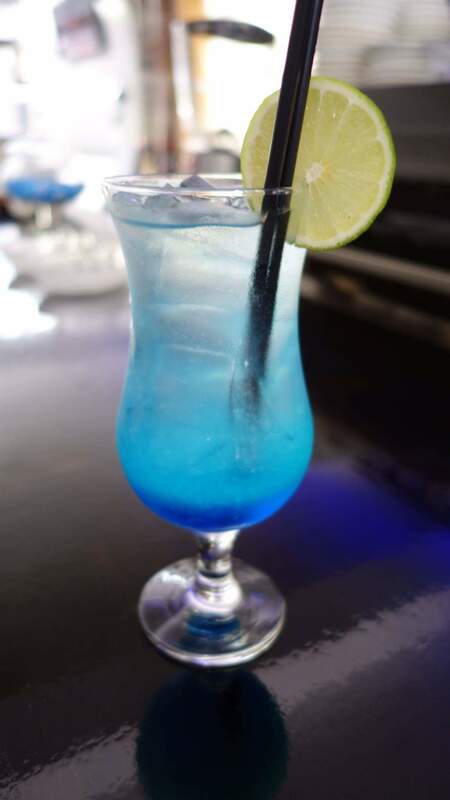 Like you would in South America – we fill the break between courses with a cocktail and so we got a Pina Colada and a Blue Lagoon. They were both well-made. The Blue Lagoon was my favourite of the day. 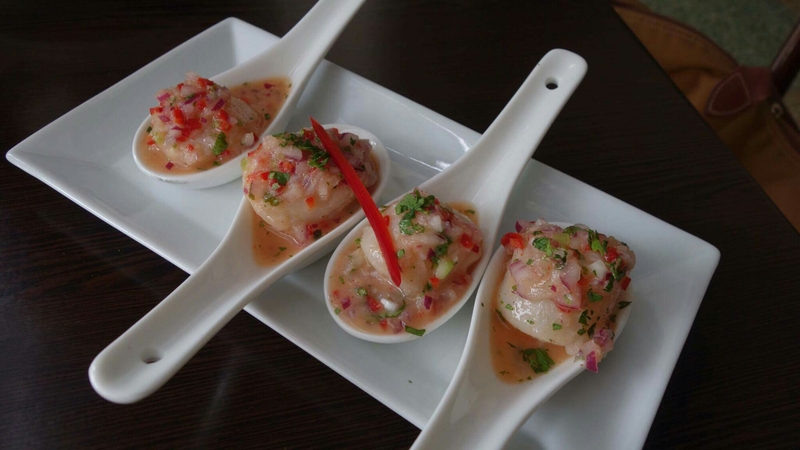 A great place to sample Peruvian foods or a few drinks after work. The staff are part of a family business and you can tell they love their work. They are so hospitable and certainly make you feel part of the family. Definitely a summer destination for locals and workers on the east side. Möbius @ the Pullman – Hotel dining back in the lime light. 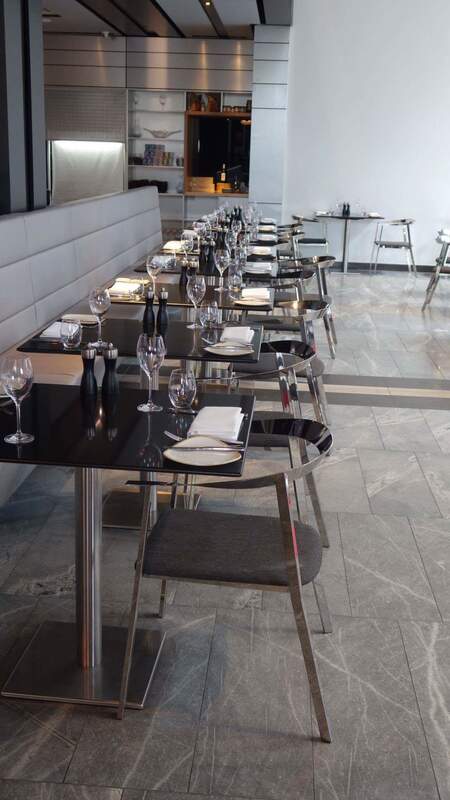 The Pullman in Mascot is a new 5 star hotel very close to Kingsford Smith Airport with a great restaurant. As you enter, it opens to a huge lobby, there are lounges, computers and space to wait for the bus or other friends to arrive. There’s also a large bar, restaurant and café. Décor is stylish, contemporary with a sophisticated feel. 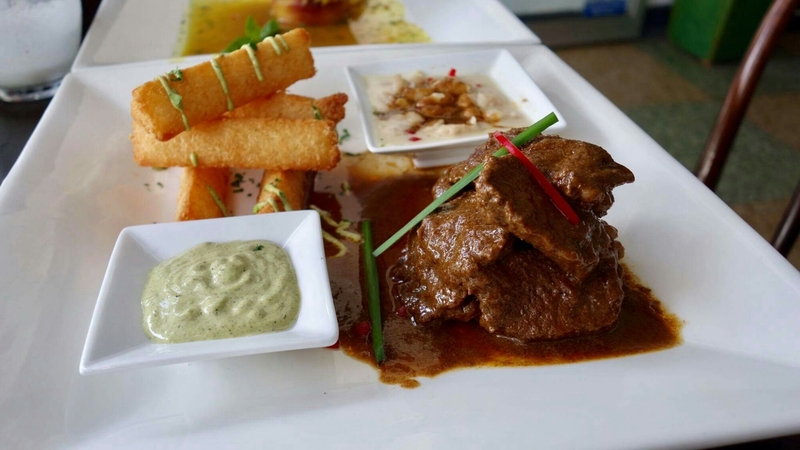 The restaurant, Möbius bar and grill is not just a hotel restaurant but a signature restaurant you could go to for a wonderful evening dinner for a special occasion. 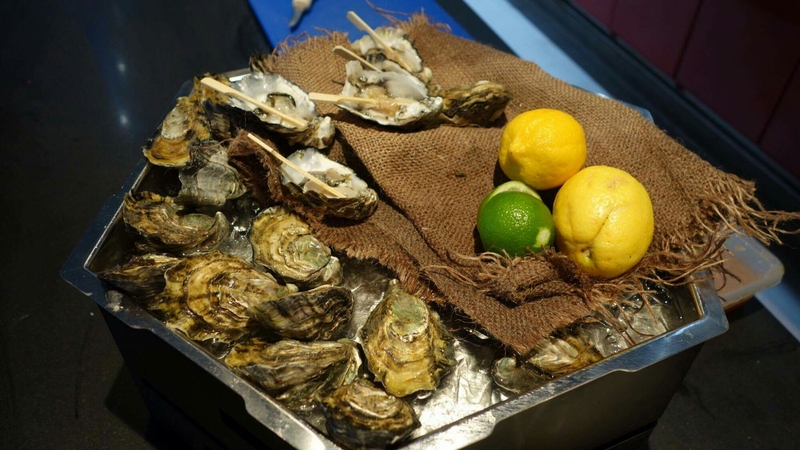 As you enter, there are small tables to sit and have a drink, I had a sparkling moscato on arrival as well as the local signature oysters which they shuck just before serving, topped with a shao zing mignonette, very fresh. There is also a fully stocked bar. 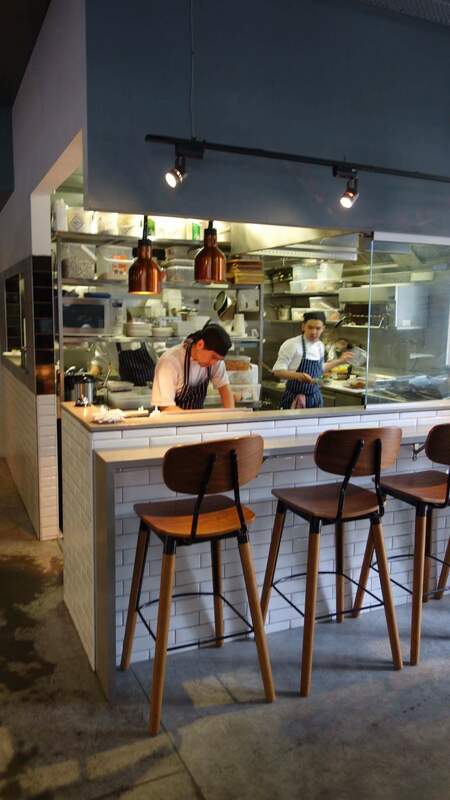 The restaurant space is quite large with an open kitchen, you can sit and watch the chefs cook. 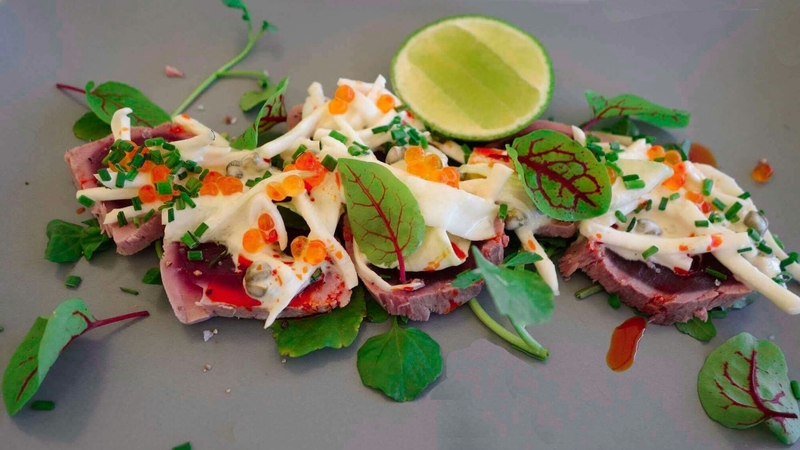 The have a seasonal menu prepared by executive chef Daniel simpson devoted the spring menu features fresh seafood cooked with great flavours. To start select from the grazing menu of marinated olives, artisan bread from Sonoma with Pepe Saya butter and some nicely marinated and lemon scented octopus as well as some flywheel sliced charcuterie, salami and pickles. 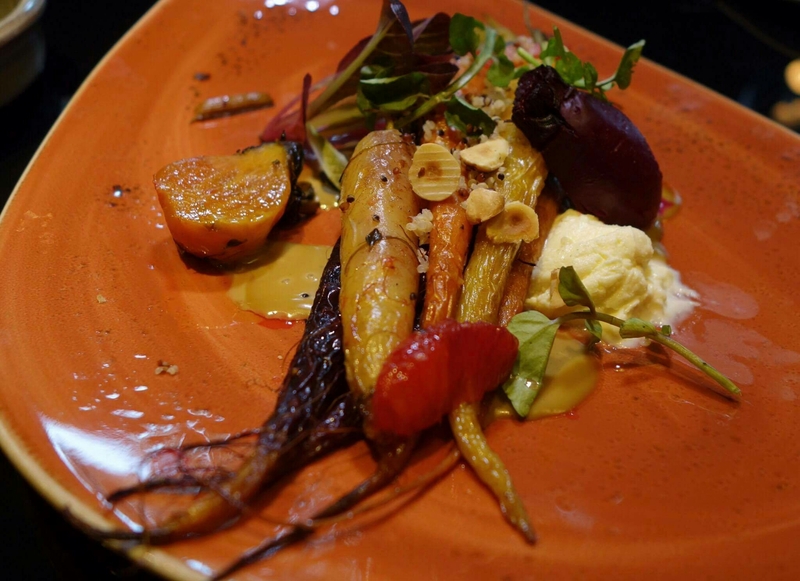 Next is a beautifully arranged salt roasted heirloom vegetables (beetroot, carrot and turnip) with quinoa, goats curd and hazelnut dressing. Followed by my favourite dish; the kingfish ceviche, beautifully flavoured with bottarga roe and tigers milk. The full blood wagyu carpaccio with quails egg, black and white garlic was also very nice. 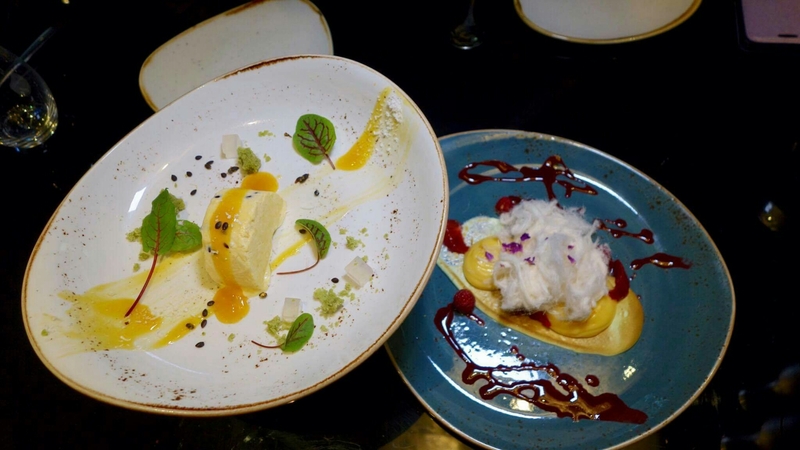 The desserts were a spectacle; A torched pandan meringue with citrus curd, raspberries and a persian fairy floss! I absolutely loved this one. The other option was the passion fruit semifredo. This came with a gorgeous fruit salad arrangement of lychees, strawberry, rose as well as a turkish delight. 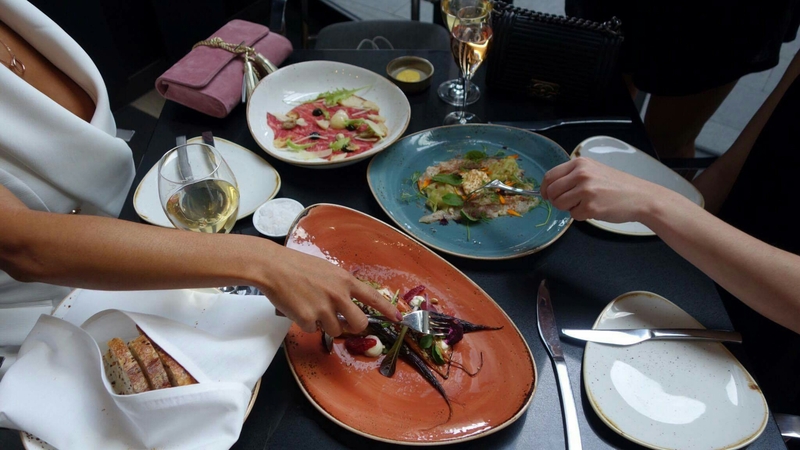 Möbius the Pullman Sydney’s signature restaurant, put hotel dining back on your hit list. With an added bonus, you always have the option of booking a room. The Rooms are large comfortable and bright. The linen is crisp and white. Styled with classic tiles and wood in the kitchen. Rooms have small bars, gowns, slippers, wi-fi access and 48 cm square inch TV’s. Why not make a night of it. 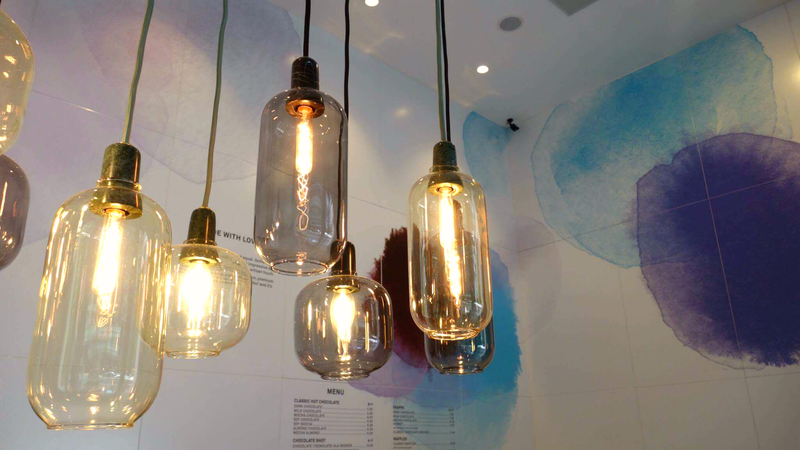 An innovative cafe on Harris St across from the Powerhouse Museum. 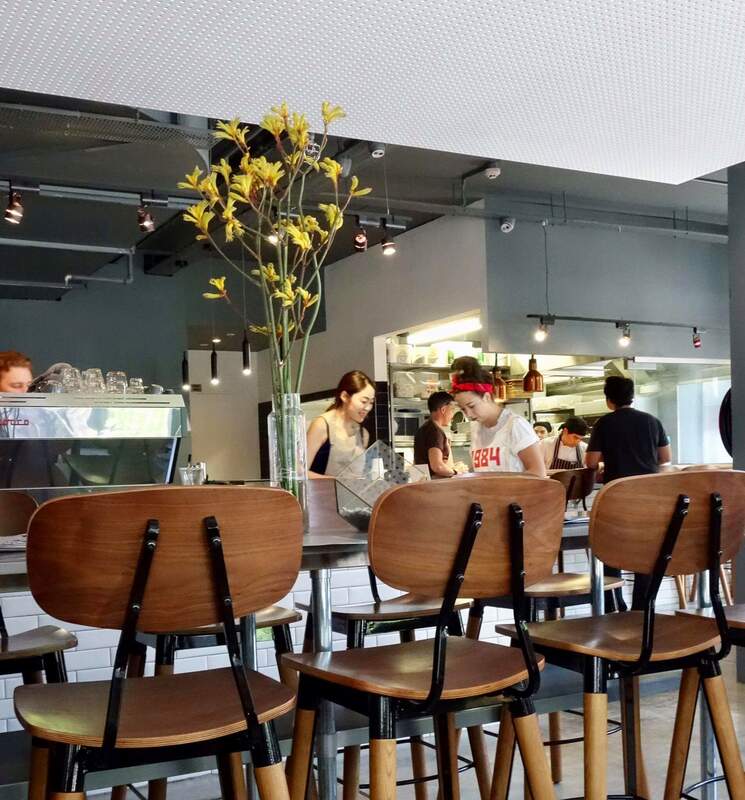 The cafè has a trendy interior with a indoor seating and a courtyard out the back. 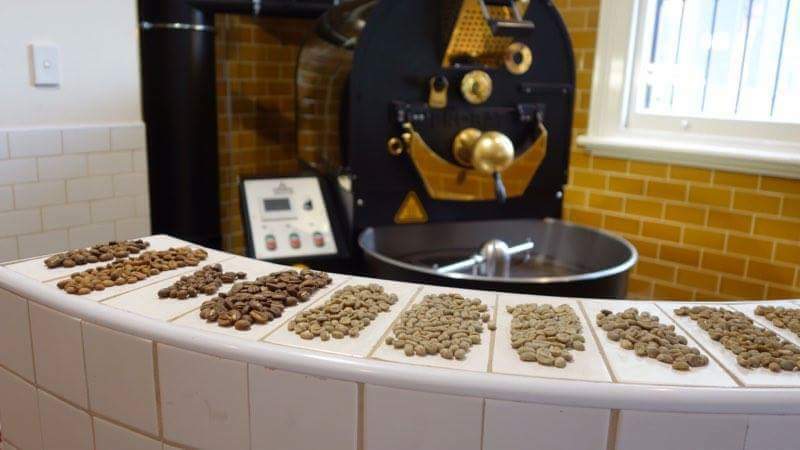 There is an onsite coffee roaster and grinder with the owner importing his own beans from Sulawesi and Java in Indonesia which make for very nice coffee. They were playing a relaxed music selection ideal for the brunch setting. The staff are very friendly, we chose to sit in the courtyard out the back. There is a nice smoke aroma as we enter the courtyard and we notice that they have a BBQ smoker in action, with the kitchen staff continually checking on it. They smoke all of their meat in house. Thus had us excited for what was to come. 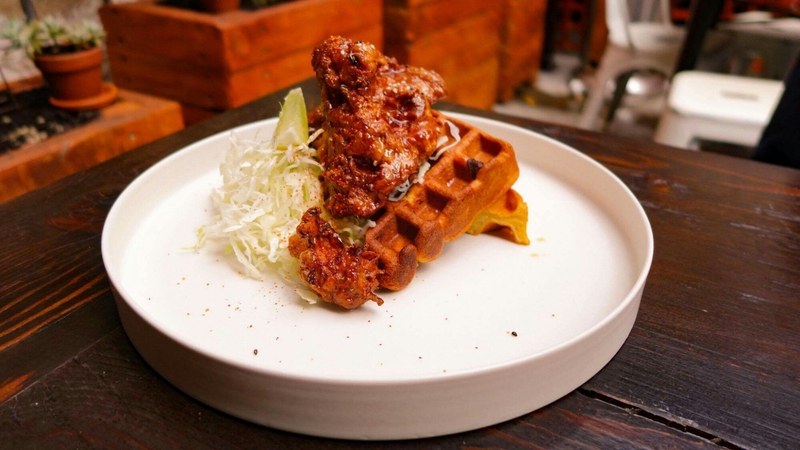 We were here for brunch so perectly acceptable to order the honey fried chicken with house made waffles. 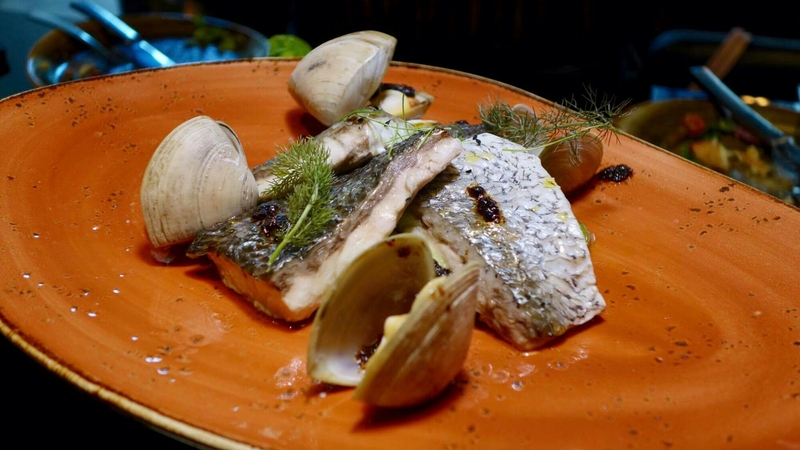 The chef is of Japanese heritige and once worked as a pastry chef at Sepia. Drawing on this to produce a beatiful light waffle and a crispy house smoked chicken karage. 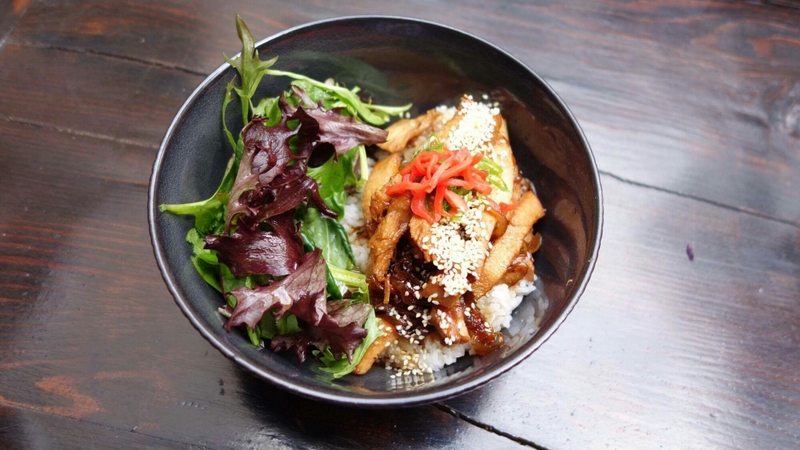 We also tried the chicken teriyaki and brown rice bowl with pickled daikon. Well prepared with nice flavour. If you are in the area or if not, make time to visit this exciting cafè producing delicious food and great coffee. 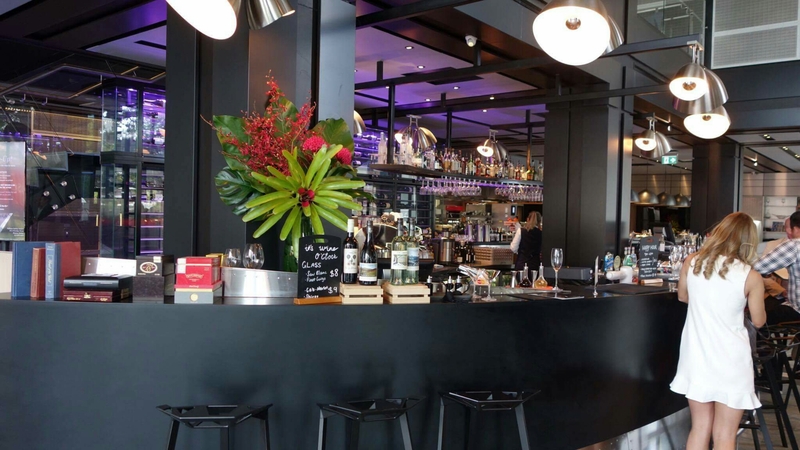 Close to Wynyard station is a restaurant called ‘Next door’, a bar that has been set up next to, and works in collaboration with ‘Made in Italy Pizzeria’. 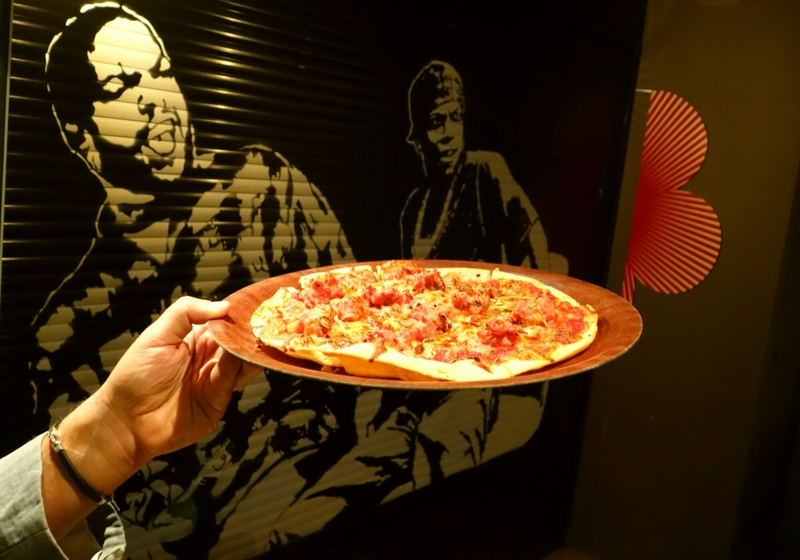 Both are set up in York Lane, ‘Next door’ has a street hip hop feel, featuring a large mural of Ice cube and Smokey from the movie Friday. They were also playing cool throwback tracks. We were met by the charismatic Fabrizio who showed us to the table and provided great service during our visit. We ordered a couple of great cocktails from the drinks list, the passionfruit caprioska and The Southside of Sicily, both very nice. They also had a range of beer, cider and wines to choose from. 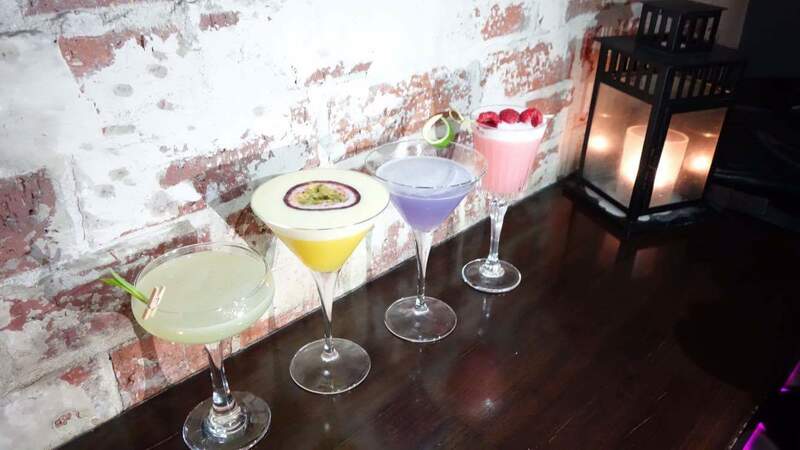 They also have a great happy hour running from 5pm-6pm perect for grabbing a bite to eat and for afterwork drinks. From there we moved on to the food, excited for the carb loading ahead. 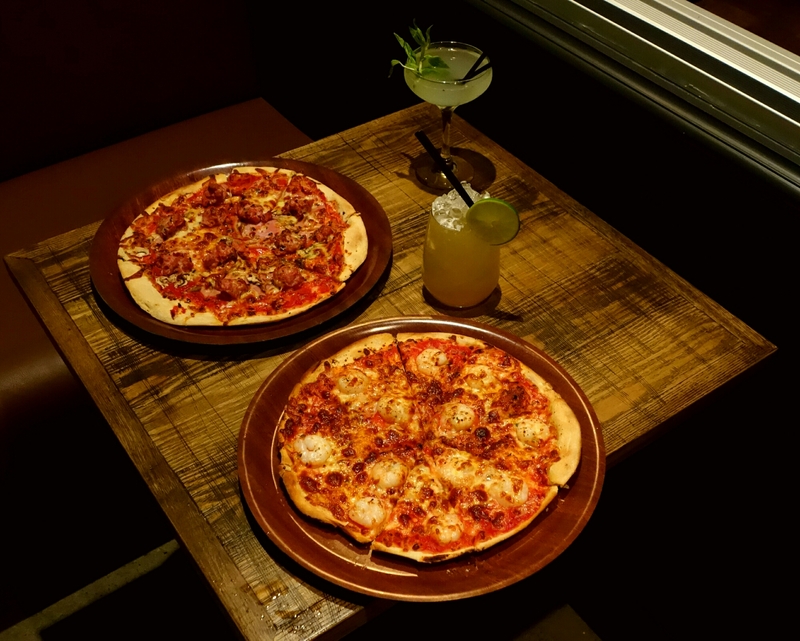 We feasted on a couple of tasty thin base pizzas to start ‘the Gamberi’, topped with delicious prawns and the Capicciosa with ham mushrooms, Italian sausage, oregano and chilli. Next the pastas; you choose the pasta and then the sauce, all served with parmesan and fresh parsley. 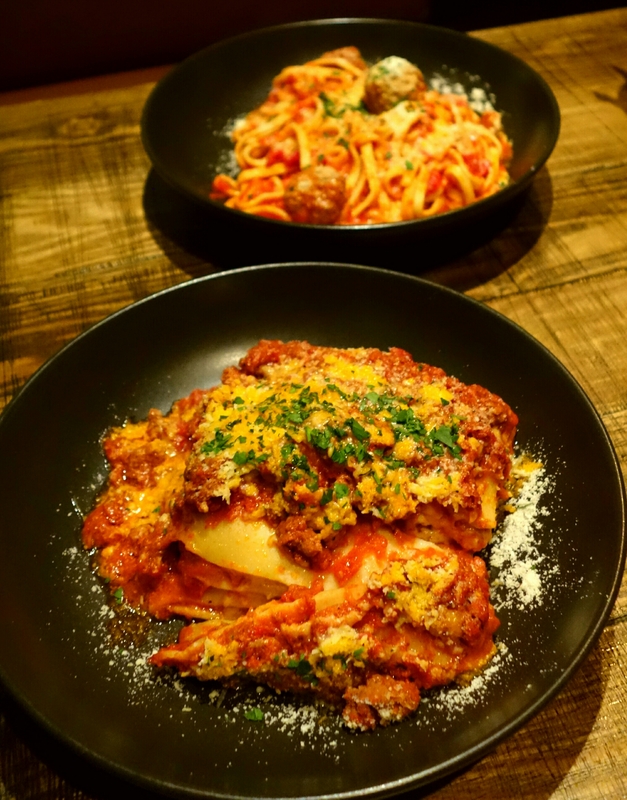 We went with some classics the fettucini polpette (meatballs) and the Lasagna. Italian Homestyle cooking with large portions. Some chunky meatballs, fettucini (al dente) with a rich tomato sauce. My favourite of the visit being the big hearty serve of lasagna. 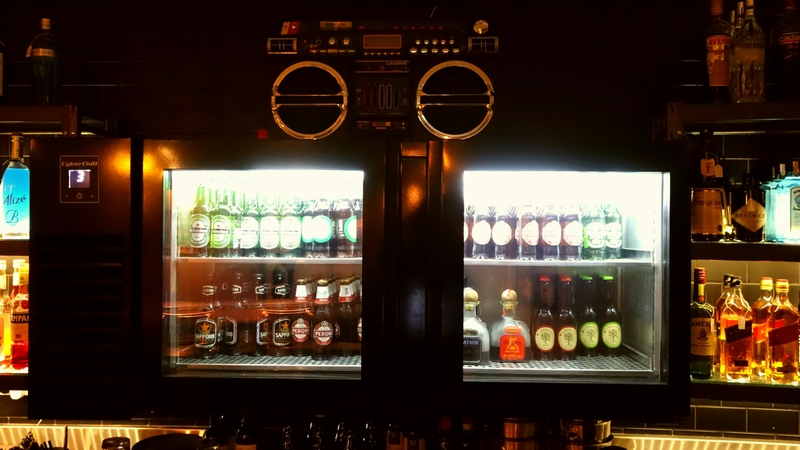 Visit for a beverage, grab some food and enjoy the tunes. #invited Thankyou to Next Door for having us. 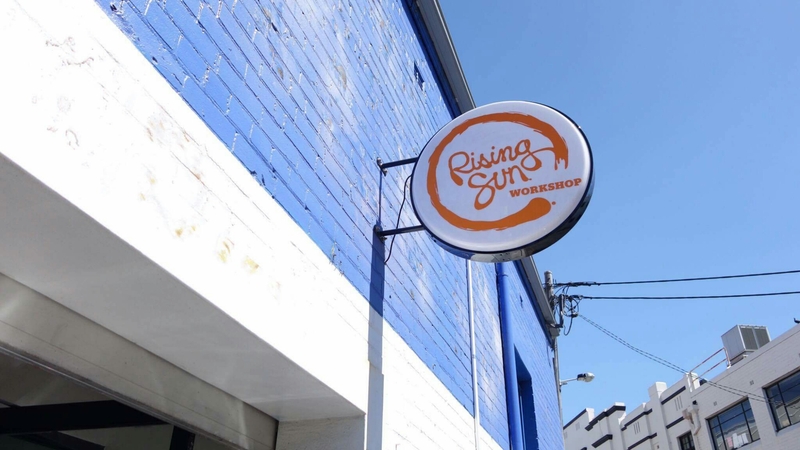 Rising Sun Workshop is located in a side street off King St, Newtown. 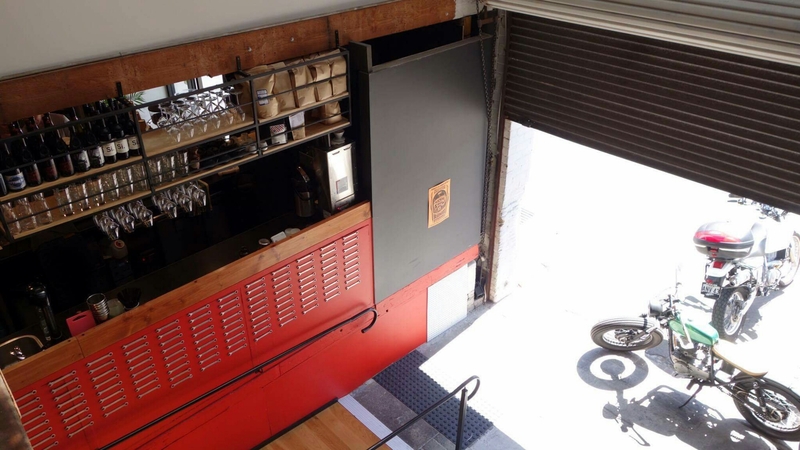 This innovative cafe is attached to a community funded garage that runs workshops where people can learn how to fix their motor bikes. It is a cool space with all sorts of bikes parked out the front. When you enter there is an open space with a garage totally separated from the cafe but allowing you to see all of the action.The cafe has a insustrial feel with a few bikes displayed and some cool artistic pieces. The staff are relaxed, friendly and provide excellent service. We stopped in for breakfast and there were a number of dishes that got our attention. The coffee by single O was nice, including a cold drip. For our meal, we ended up ordering the breakfast ramen and the Hokkaido bacon and egg milk bun. 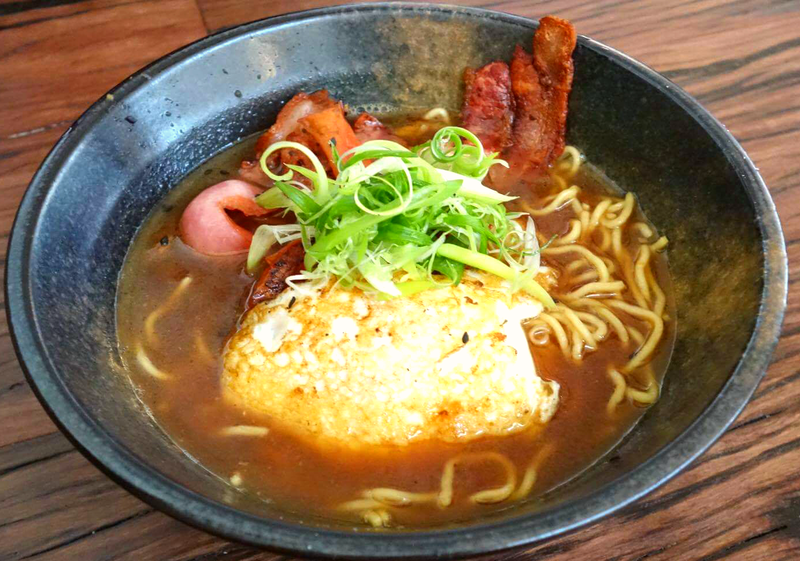 The breakfast ramen was delicous, not just a gimmick. Buttered toast broth with bacon, eggs and tomato. We also heard that they have previously done a mac and cheese ramen on a specials menu. I would have loved to have tried this one. The Hokkaido bacon and egg milk bun with kimslaw was also very tasty. 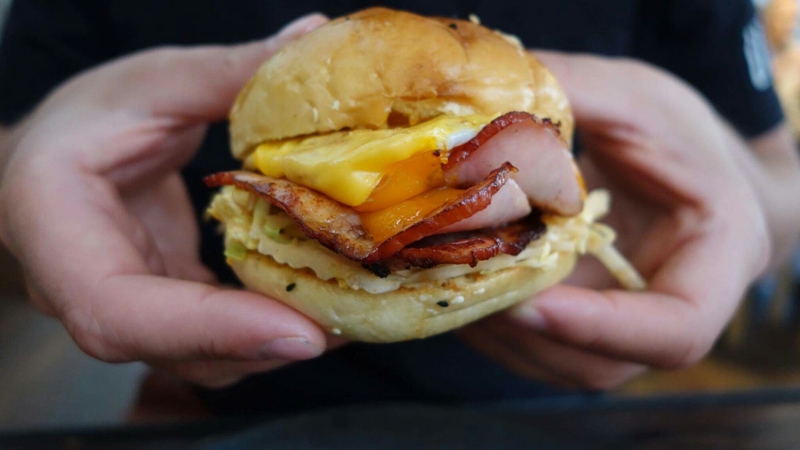 A Japanese/Korean take on an Aussie favourite(the bacon and egg roll) soft milk bun, bacon poached egg and a kimchi/slaw hybrid for an added flavour kick. 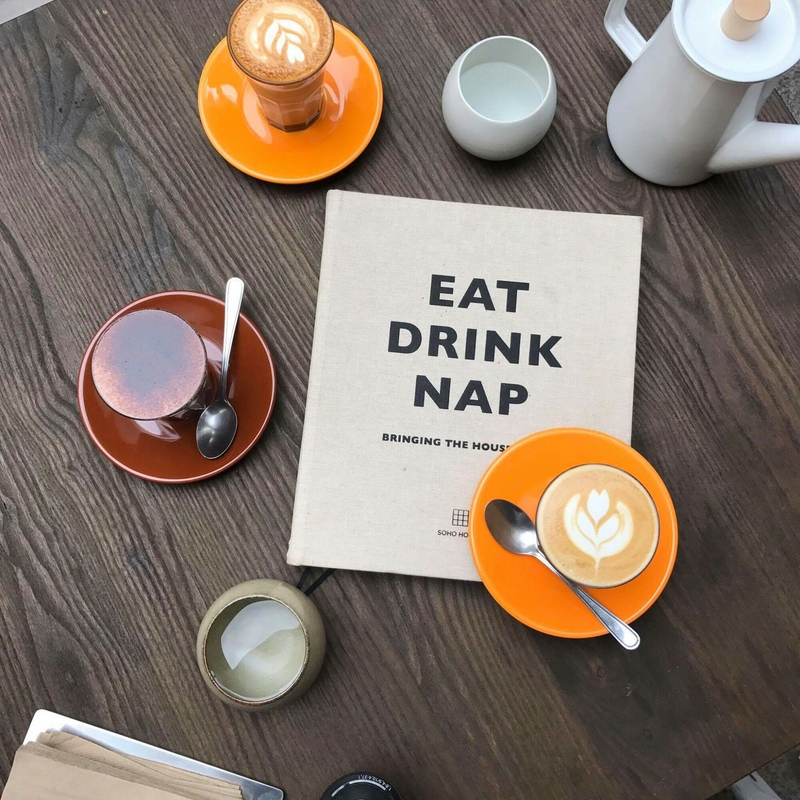 We loved this cafe, the concept and their innovative menu. If you are after something a more exciting than the norm, this place is definitely recommended. The smoking panda on park street can be found upstairs of the hotel coronation. 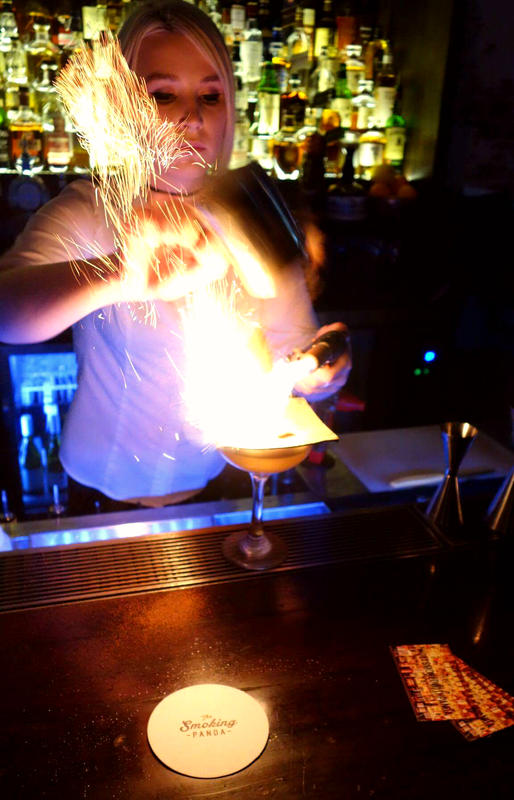 Open til late, has a fully stocked bar with a huge variety of drinks, in particular, cocktails and mocktails that the bartenders or mixologists make like they’re a piece of art. 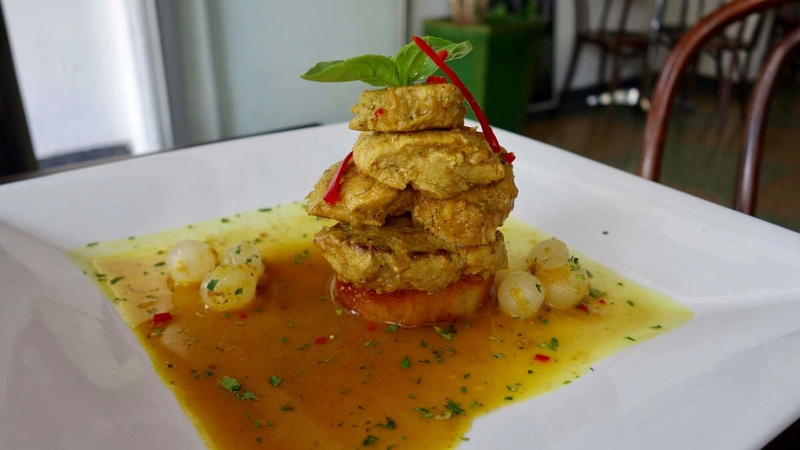 It also has bar food, quality bar food that the chef devised and it is presented beautifully. Bar tables and also a seated area. They even have an aquarium with jellyfish. Great for a date or with group of friends. We tried a lot of the cocktails and they were beautiful, and tasty. I first went with the pandemonium: ketel one vodka, apricot brandy, amaro montenegro, lemon, peach bitters and egg white. It is then set on flames and topped with a beautiful artwork of a panda 🐼 made with cinnamon. This was delicious. 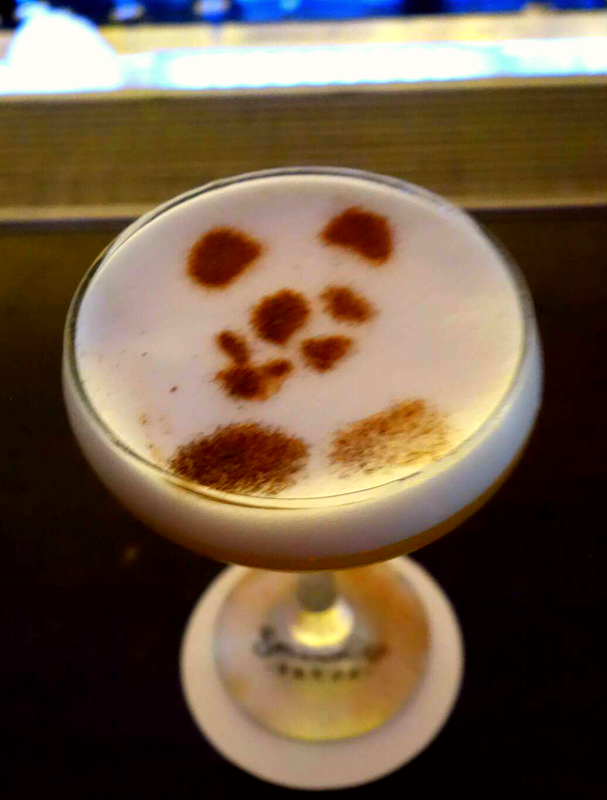 Inspired by the theatrics I also got smoking panda: gold infused grapefruit, pineapple honey syrup, grand marnier, red berry infused vinegar and then served in a cloche smoking and topped with fresh lavender. They also have classic cocktails or tailor a drink to your liking. 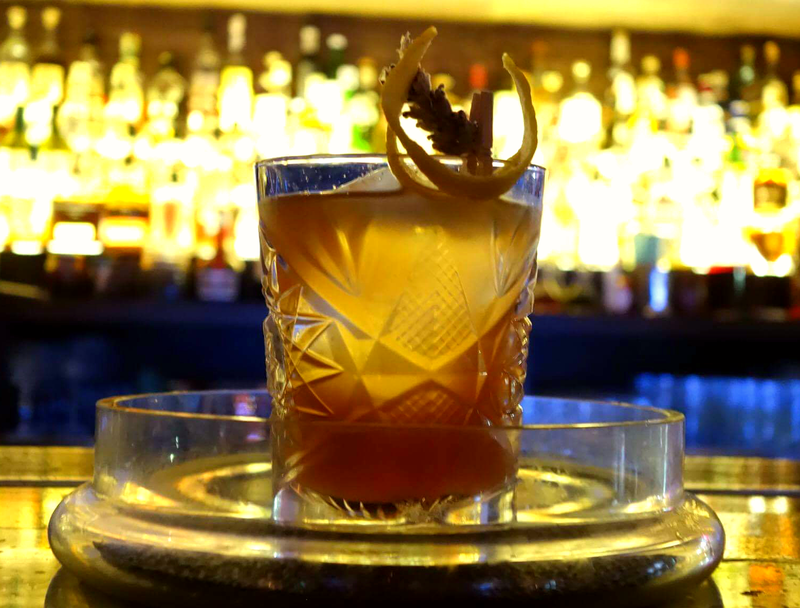 My husband likes whiskey, with his cocktail of choice being the old fashioned, which they obliged to make with the Glenmorangie la quinta rueben. 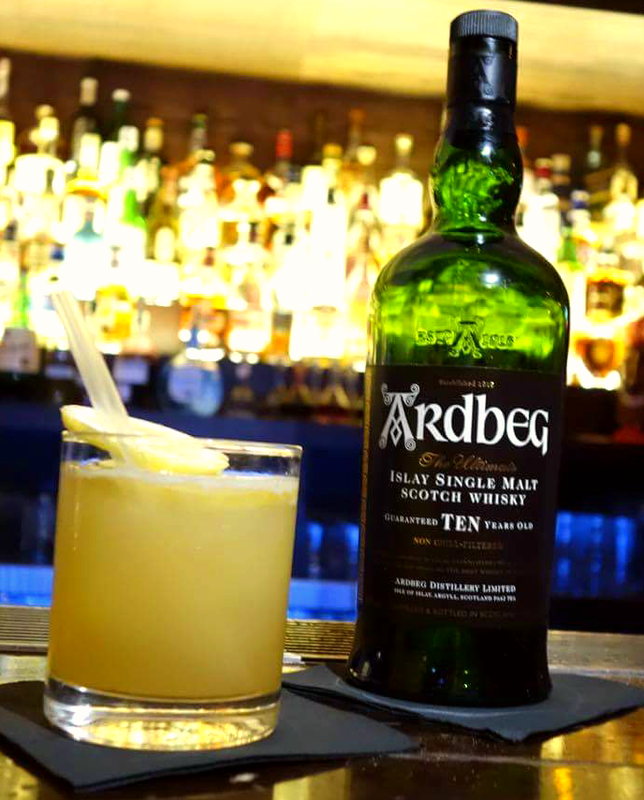 He also very much enjoyed the Ardberg 10 Penacillin. They had a great whisky selection at this bar. On the food menu are dim sum (Tuesday dumplings $1 said the promo), sliders and other snacks. 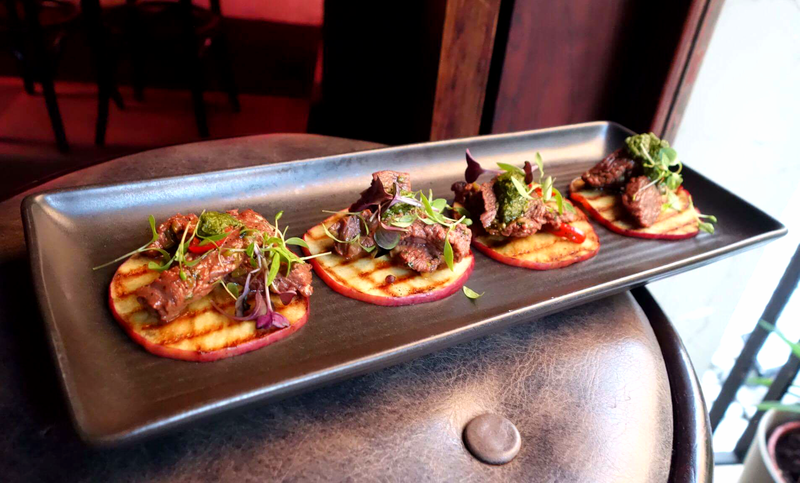 We tried the barramundi fish cakes, the yellowfin tuna ceviche bites and the smokey citrus beef pinchoss; marinated beef tenderloin on a grilled piece of apple. All the chefs creation. 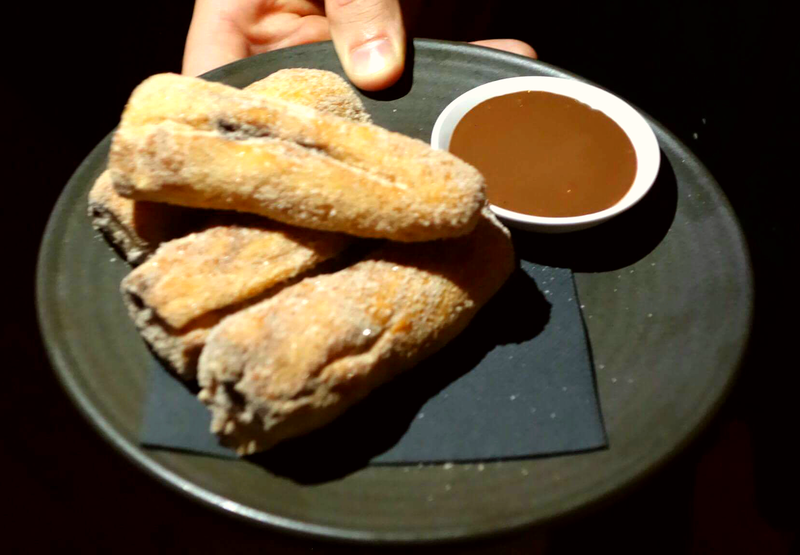 Another of his menu additions was the finger donuts – fried donuts filled with white and dark chocolate buttons covered in cinnamon and a chocolate dipping sauce. This is an awesome place to visit, especially for cocktails. 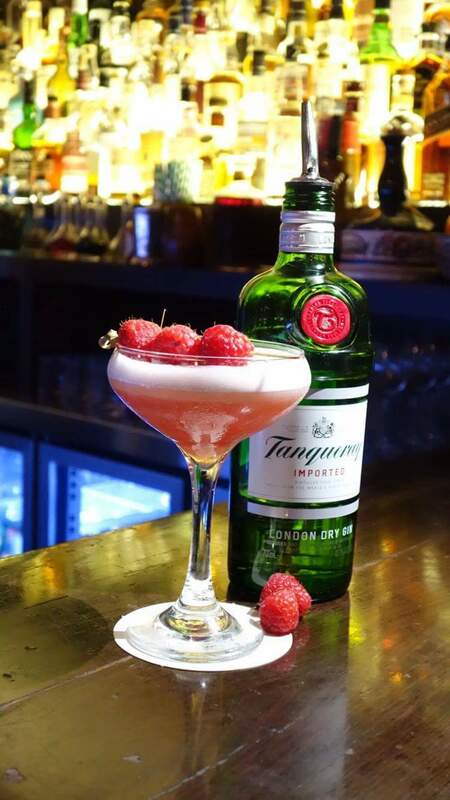 They may even consider a cocktail masterclass in the future. 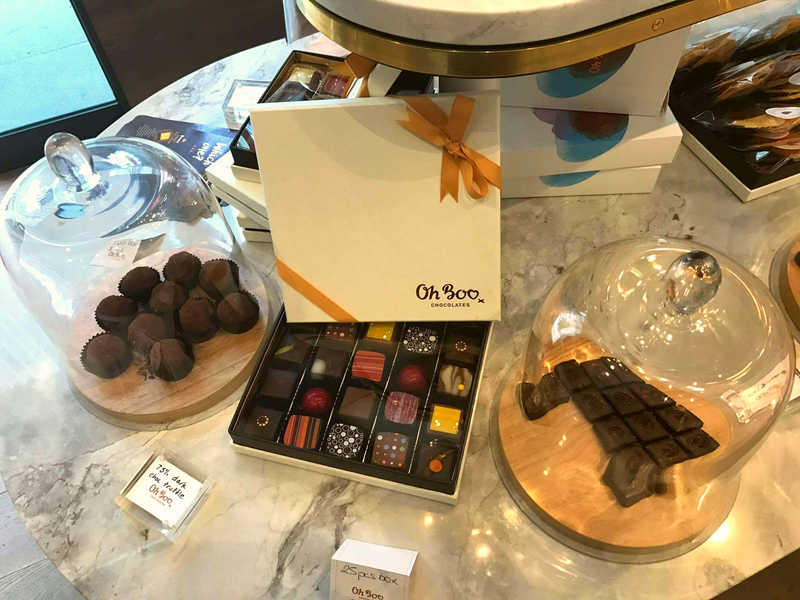 Oh boo is a boutique chocolate shop located in the newly created Barangaroo dining pecinct. The area is a buzz with a variety of restaurants and cafes to choose from. The shop itself is fresh and vibrant with an array of nicely decorated choclates on display. The owner and staff are welcoming and passionate about their product. Their motto being, made with love. The chocolates here are almost too pretty to eat, with appealing shapes, glazes and decorated with beatutfully printed patterns. 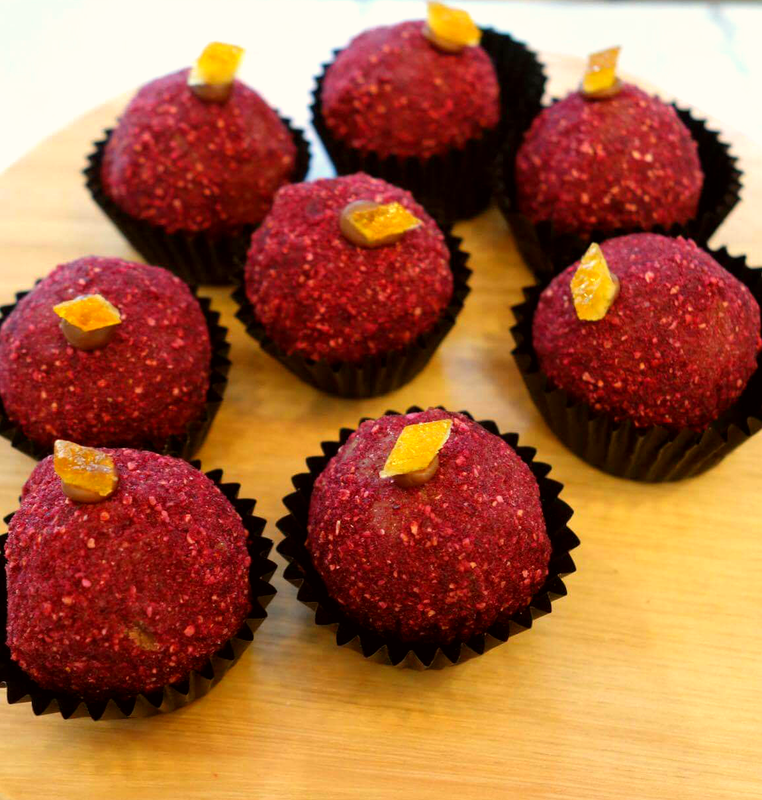 There are a number of flavours available, so something for everyone and all very delicious. 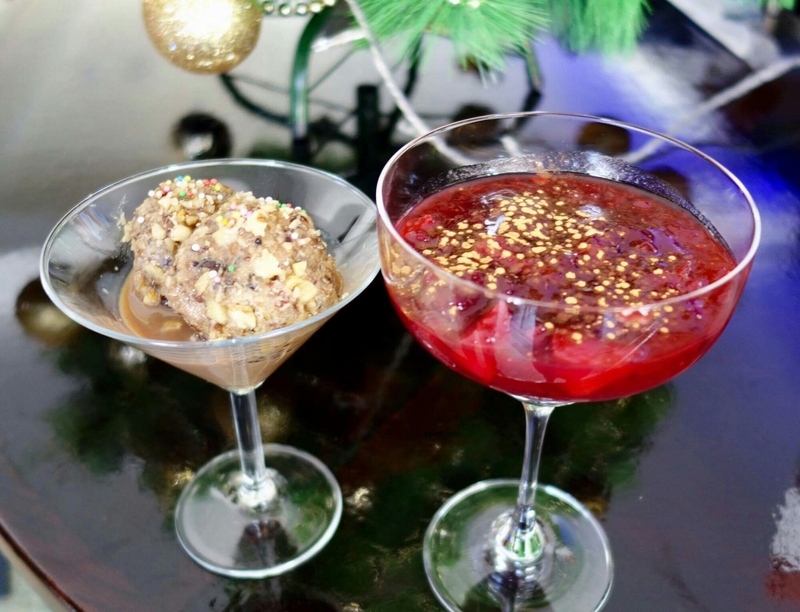 Some of our favourites were the silky, a dark chocolate prailine with caramel and macadamia. The Snazzy, a chic red glazed dome filled with strawberry and Tasmanian pepperberries. 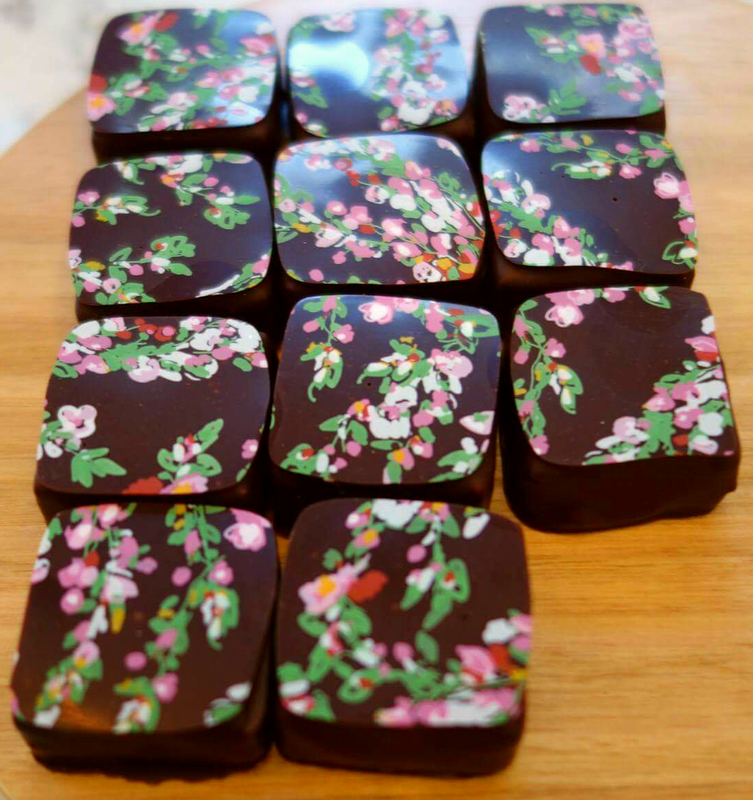 The Spicy, a dark chocolate ganache with ginger and mandarin with an aboriginal art inspired design. The boutique also sells coffee and hot choclate, pick out a few choclates, grab a seat outfront and enjoy. 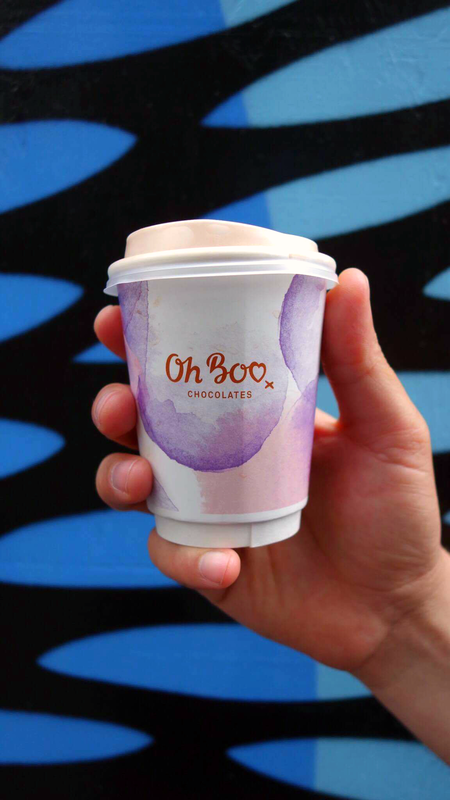 Oh boo is ideal for a little treat after dining at the surrounding restaurants. Another option is to pick a few to take home for later. They also have gift boxes if you are after a gift for someone with a bit of a sweet tooth. 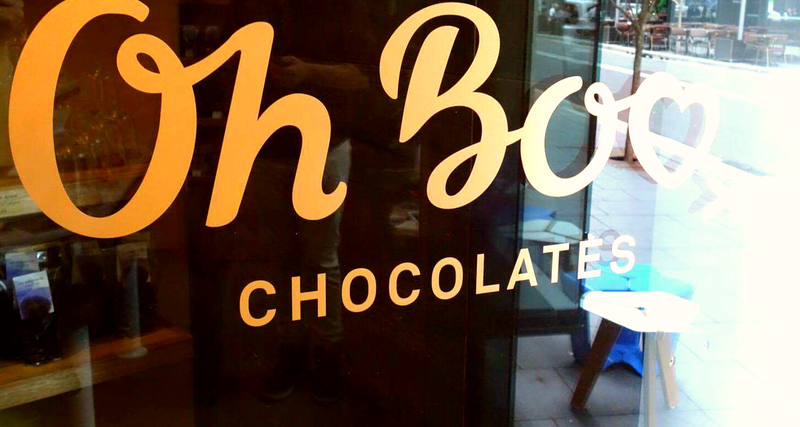 Oh Boo if you are out and about around Barangaroo and are after something sweet, give them a try.